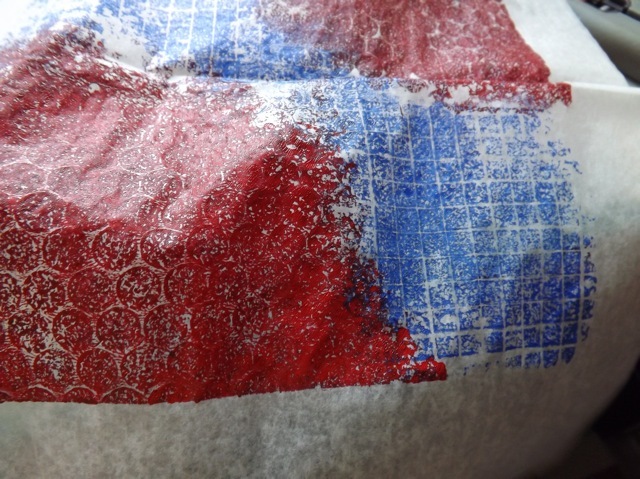 Taking a break from quilting for a moment while I plan to go to the fabric shop for backing material (nearly impossible to create from scraps) so I had time to test out something on the Gelli plate. I have been annoyed recently because my silicone spatula’s head keeps popping off. 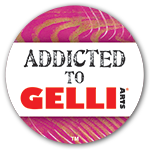 I finally replaced it with a new one, but the look of the head reminded me of Gelli tools I’ve seen. I also saw a silicone pastry brush (2 for £1) so got them as well. 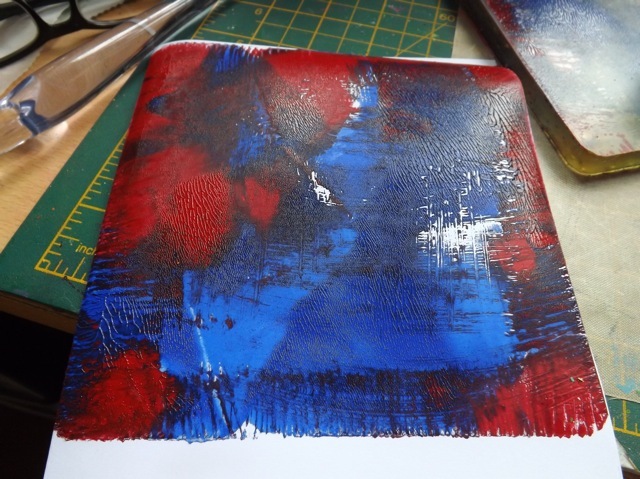 By spreading the paint with the spatula rather than the brayer I got interesting streaks with no blending. I like that for adding blocks of colour. I experimented with flicking the pastry brush across the top and along the edges – that turned out pretty cool, but hard to see here. It’s most noticeable along the bottom edge, I think, and the flicks in the white area. Def. more to play with there! The other thing I wanted to try was sponging on the paint. I had seen that in the video by ASpriteMetamorphosis and wanted to try it out. 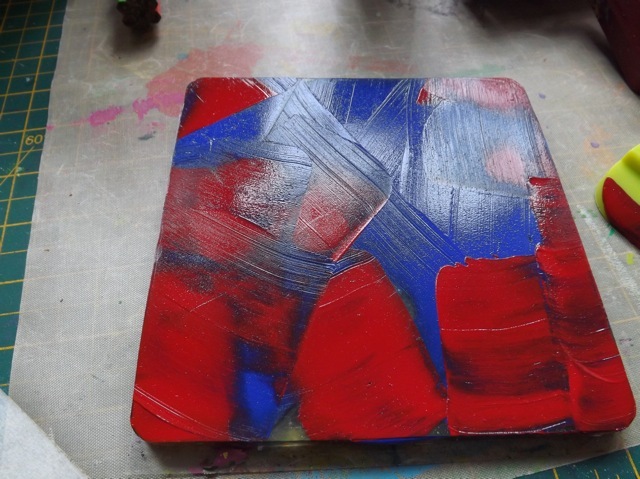 I sponged on the paint in the corners then pressed on the grid plate. You can maybe see that the paint is very textured. 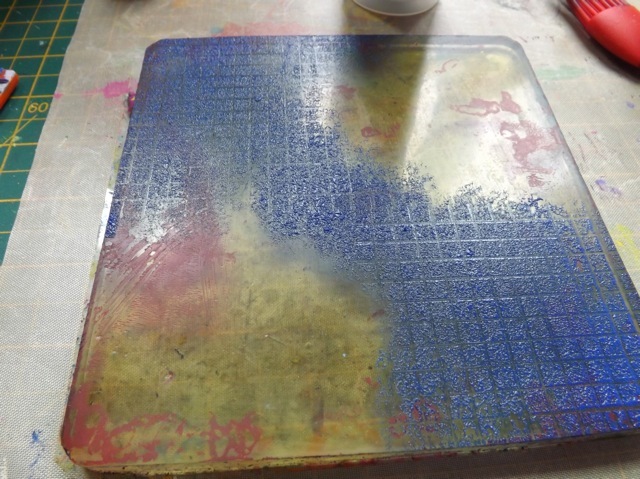 I pressed sequin waste in the other two corners – again, the sponging controls the areas of colour better than the brayer does! I wanted to let the paint dry on the plate, then add white and pull but I was too impatient (it takes a long time for the paint to dry LOL!) so I pulled a Deli paper print first. 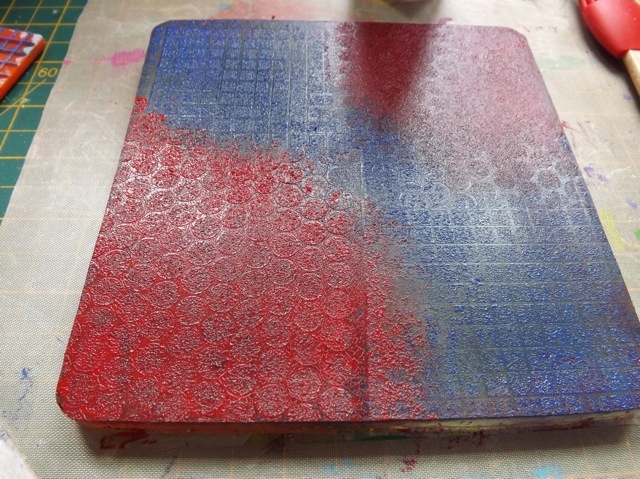 I really like the texture of the sponge inside the sequin holes, and the white of the grid where it removed the paint. Then I added the white and brayered it on. The paint is dry now, but you can see the deli paper pull left a LOT behind. 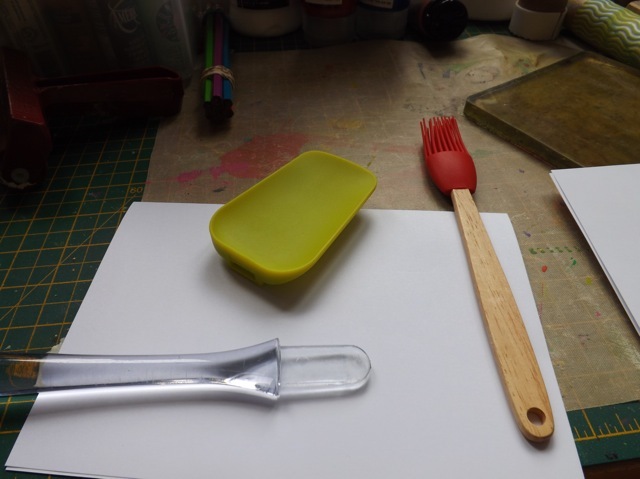 I actually used the clean side of my silicon spatula to really apply pressure to the back of the paper and get as much under-layer paint to print as I could. 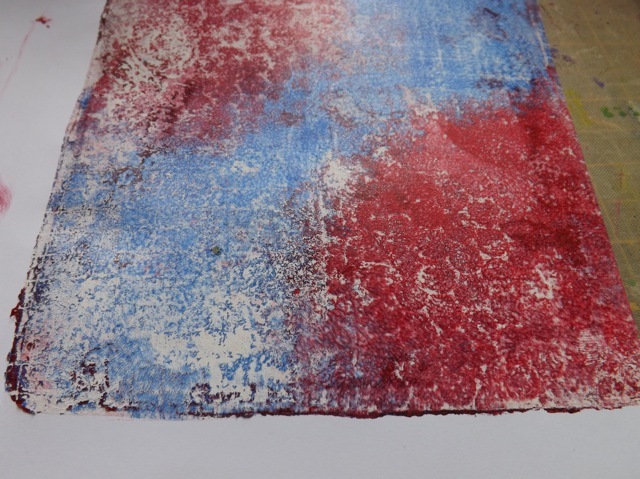 It worked really well, and as it is soft and flexible didn’t damage the paper at all. 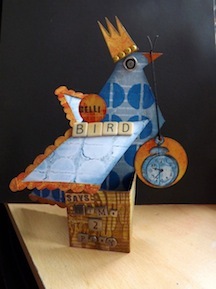 Really like this one IRL and it may end up forming the base of my WOYWW ATCs (too many acronyms?) for the 4th anniversary. So there you go – a couple more things that you just may have hanging around. 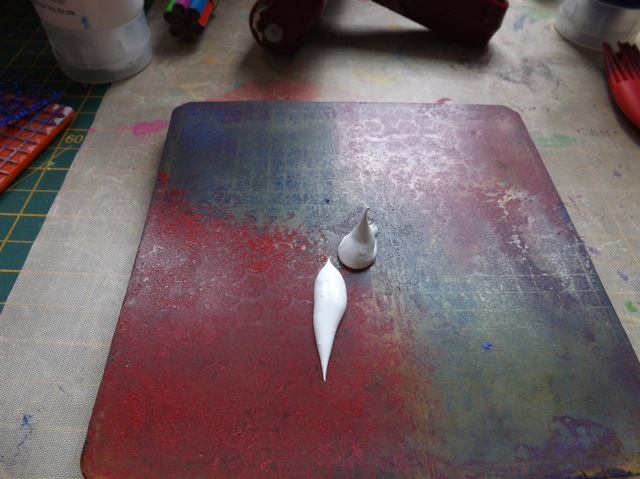 Although in the interest of safety, I would say once you use cooking stuff for paint play, you leave it on your desk and don’t decide to scrape out the mayo jar, or baste the Sunday roast with them…just sayin’…. Thanks for stopping by my blog for WOYWW! 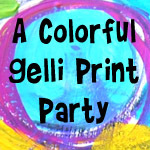 Love this tutorial – and how you printed on the deli paper- I LOVE to use deli paper in my art journals /altered books. looks like you have been having lots of experimental fun! Soooo agree about not reusing kitchenware after the crafting has got hold of it! TFS! I wonder if they have them at the £ shop? Do you know what they are used for? I’ll be on the lookout! Shame, I was in town today and never went in to look for goodies to play with! DOH!